What's Included In The Box? The Garmin nuvi 58LMT Newly Overhauled ships with the following items included. Preloaded with City Navigator® NT U. Lifetime maps¹ (indicated by LM after model number on the box). Lifetime traffic antenna/vehicle power cable. Advanced Driving Navigation at a Value Price. Easy-to-use dedicated GPS navigator with 5.0-inch dual-orientation display. Preloaded with detailed maps of the lower 49 U. States with free lifetime¹ map updates and traffic avoidance². Garmin Real Directions guide like a friend using landmarks and traffic lights. Find new and popular restaurants, shops and more with Foursquare®. Direct Access simplifies navigating to select complex destinations, like malls and airports. For driving directions on the road, put away the smartphone and power on your nüvi. Nüvi 58LMT is an easy-to-use, dedicated GPS navigator that does not rely on cellular signals and is unaffected by cellular dead zones. Nüvi 58LMT features sleek styling and a bright, 5.0-inch dual-orientation display, for use horizontally or vertically. Its included suction cup mount keeps it firmly in place. Nüvi 58LMT arrives pre-loaded with detailed maps of the U. With free lifetime¹ map updates, your routes are sure to reflect the most up-to-date maps, points of interest (POI) and navigation information available. Nüvi 58LMT features Garmin Traffic to help you spend more time on the move. With Garmin Traffic, your driving map remains onscreen at all times. Traffic alerts appear to the side of your map and messages are spoken, too. Garmin Traffic can give details about the situation, such as how many minutes of delay to expect and if there are any possible detours. It can even confirm whether or not you are on the fastest route. Garmin Traffic is delivered straight to your nüvi no smartphone needed. Nüvi 58LMT redefines spoken turn-by-turn directions with Garmin Real Directions, easy-to-understand driving directions that guide like a friend using recognizable landmarks, buildings and traffic lights. No more stress from trying to read street names. Instead, hear clearly spoken guidance, like Turn left after the gas station. Foursquare Adds Millions of New POIs. Nüvi 58LMT makes it easy to find addresses and millions of POIs (points of interest) that is, businesses, stores, restaurants or other destinations. Our POI database also includes accurate, relevant information sourced from Foursquare. Now, when you search, the most relevant Foursquare result appears at the top of the list. Its an easy way to discover new and popular restaurants, shops and more. Find Exactly Where You Need to Go. The Direct Access feature simplifies navigating to select complex destinations, like airports and shopping malls, by finding a place within a larger location. Direct Access even navigates through parking lots to find the entrance nearest your destination. When navigating to the mall, Direct Access gives additional location information for specific retail stores inside. For example, Arriving at Woodfield Mall. Anthropologie is inside, on the upper level. Navigate Complex Interchanges with Ease. Nüvi 58LMT has lane assist with junction view that displays upcoming junctions and uses brightly colored arrows to indicate your proper lane. Easier to Search, Quicker to Find. Nüvi 58LMT has a search field that makes it easy to find addresses and millions of POIs, in a single place. No need to search for a hard-to-read or nonexistent sign; with a glance at nüvi 58LMT, youll see your current street. Nüvi also displays speed limit, current speed and arrival time. With the Up Ahead feature, you can easily find places you want without leaving the map. As you drive your route, Up Ahead constantly informs you of nearby services, including food, fuel and ATMs. Best of all, Up Ahead is customizable, so you can always know the location of favorite destinations along the way. Nüvi 58LMT issues an audible alert and displays an onscreen warning whenever you approach a school zone. The displayed speed limit also changes to reflect the school zone speed limit. Add a Wireless Backup Camera. Once connected, you can easily see vehicles, pedestrians and other obstacles right on the nüvi display, as you move in reverse. Use Garmin Express to keep your nüvi up-to-date. Garmin Express makes it easy to update maps and software, transfer favorites to and from devices, and install free custom vehicles and voices. Here is a list of. Nuvi 58LMT Newly Overhauled features. Along with a few user tips. Physical dimensions 5.5"W x 3.4"H x 0.8D (13.9 x 8.6 x 2.0 cm). Display size, WxH 4.4"W x 2.5"H (11.1 x 6.3 cm); 5.0 diag (12.7 cm). Display resolution, WxH 480 x 272 pixels. Display type WQVGA color TFT with white backlight. Weight 6.4 oz (180.1 g). Battery life up to 2 hours. Includes lifetime map updates: yes. Built-in memory internal solid state. Accepts data cards microSD card (not included). Custom POIs (ability to add additional points of interest): yes. Turn right ON ELM STREET in 500 ft. Traffic compatible (routes around traffic with a receiver and subscription): yes. Lifetime traffic updates (receive free lifetime traffic updates): yes. Lane assist (guides to proper lane for navigation): yes. Junction view (displays junction signs): yes. Route avoidance avoid highways, tolls etc. Speed limit indicator displays speed limit for most major roads in the U. View upcoming points of interest along route: yes. This USB mass storage device is compatible with Windows® XP or newer and Mac® OS X 10.4 or later. 5.5W x 3.4H x. 8D in (13.9 x 8.6 x 2 cm). 4.4W x 2.5H in (11.1 x 6.3 cm); 5.0 in diag (12.7 cm). WQVGA color TFT with white backlight. 6.4 oz (180.1 g). Bluechart g2 Vision Map Compatible. Garmin Connect compatible (online community where you analyze, categorize and share data). Turn right in 500 ft. Speech recognition (navigate with voice commands). Automatic routing (turn by turn routing on roads). Auto sort multiple destinations (provides most direct route). Auto re-route (fast off-route and detour recalculation). Choice of route setup (faster time, shorter distance, off road). Custom POIs (ability to add additional points of interest). Hands-free calling with Bluetooth® wireless technology. XM® Navtraffic (includes basic weather) & Radio for U. Feature (find closest hospitals, police & gas stations, nearest address & intersection). Car locator feature (marks position when removed from windshield mount). Configurable vehicle icons (select car-shaped icons for map navigation). World travel clock, currency & measurement converter, calculator. Qwerty or ABC keyboard (choose keyboard layout). Data Services with Bluetooth Technology. TrafficTrends (calculates routes from predicted traffic flow). MyTrends (predicts routes from user's navigation behavior). Services (accurate real-time travel data). Garmin Garage voices compatible (download custom voices). Unit-to-unit transfer (shares data wirelessly with similar units). Photo navigation (navigate to geotagged photos). 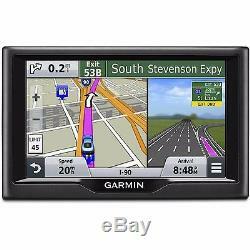 The item "Garmin Nuvi 58LMT 5-Inch GPS Lifetime Maps USA & Canada & Traffic 010-01400-05" is in sale since Tuesday, August 22, 2017. This item is in the category "Consumer Electronics\Vehicle Electronics & GPS\GPS Units".